TEHRAN, August 22. /TASS/. Iran will not need additional air defense systems after getting from Russia the S-300 anti-aircraft missile defense systems and commissioning Iran’s similar system Bavar (Belief) 373. Therefore, Iran’s Ministry of Defense intends to focus on negotiations with Russia on the purchase of the Sukhoi aircraft, Iranian Defense Minister Brigadier General Hossein Dehghan told Iran’s TV on Sunday evening. “We don’t need other long-range air defense systems, (in addition to the S-300 and Bavar-373), we no longer plan to purchase them. Therefore, the Iranian Defense Ministry’s agenda includes consultations with Russia on the purchase of Sukhoi aircraft. We need to strengthen our Air Force,” he said. According to him, complex tests of the Bavar-373 air defense missile system will be held in the near future. “At the request of the President (of Iran Hassan Rouhani), the first test will be intercepting a ballistic missile. If the tests prove successful, the system will go into serial production, and its combat deployment will begin before the end of the year”, the minister said. On Sunday, Tehran hosted an exhibition of achievements of the Iranian defense industry. The exhibition for the first time presented to the general public the Bavar 373 system, which, according to Iranian sources, is an analogue of Russia’s S-300, as well as Iran’s first national turturbojet engine that has been named Owj. Iran had signed a contract with Russia on the supply of the S-300 missile defense systems in 2007. However, its implementation was suspended after the United Nations Security Council passed on June 9, 2010 resolution 1929 which banned the transfer of any state-of-the-art weapons, including missile and missile systems, to Teheran. In April 2015, Russian President Vladimir Putin lifted the ban on supplies of S-300 systems to Iran and the contract was resumed in November 2015. The contract will be implemented by the year end, according to Sergei Chemezov, CEO of Russia’s state corporation Rostec. Russia’s Deputy Prime Minister Dmitry Rogozin said previously Russia had fulfilled 50% of its liabilities under the contract. “Russian Su-34 attack aircraft have destroyed terrorists’ illegal oil production facilities in al-Taura located 42 kilometers [roughly 26 miles] to the southwest of Raqqa,” the Russian Defense Ministry said on Tuesday. During the Russian military campaign in Syria, a series of technical glitches were found in the newest Sukhoi jets, defense industry sources said. 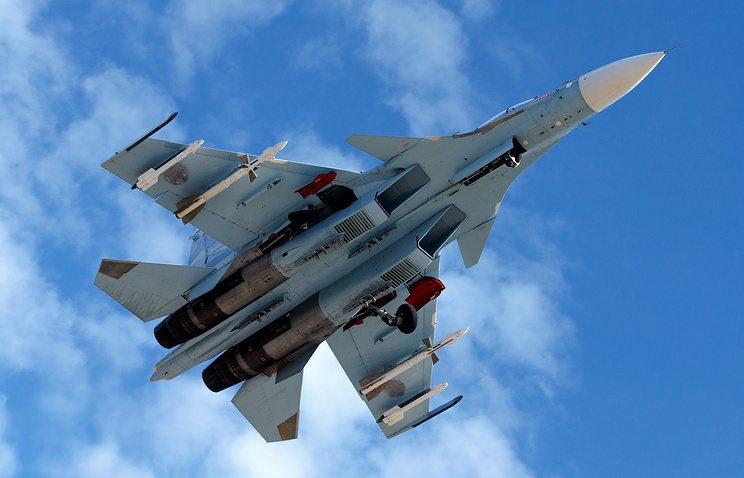 According to the Russian Defense Ministry, the operation involved Su-34 bombers and Su-35S multirole jet fighters.Malfunctions were detected in the flight control system and engines of the aircraft, the sources told RNS news agency. They added that the malfunctions were “not critical” and had no impact on the course of the campaign. Specialists from the Sukhoi Design Bureau as well as two Russian aircraft manufacturer were at the Hmeymim airbase, the centerpiece of the military campaign. The sources said that maintenance and details replacement were carried out at the base. All glitches were minor and fixed within a very short time. Last October, Strategy Page reported that the Russian military faced difficulties with maintaining its modern warplanes in the sand and dust of the Middle East. Russian maintenance crews worked overtime to adapt the aircraft involved in the operation to the environment. The Su-34 is one of Russia’s most advanced combat jets. The Syrian campaign involved six Su-34 bombers. The development of the aircraft began during the Soviet era, and the first prototype conducted a test flight in 1990. In 2006 the Su-34 began its flight tests and on March 21, 2014, the aircraft entered service with the Russian Armed Forces. The Su-34 is Russia’s most advanced interdiction aircraft. It made its combat debut over Syria recently. It is armed with R-73 dogfighting missiles and R-77 long-range radar-guided air-to-air missiles. The aircraft has a combat radius of nearly 700 miles on internal fuel but is also capable of aerial refueling. The Su-35 fighter jet is an upgraded version of the Su-27 multirole fighter. It was first introduced to a foreign audience at the 2013 Paris Air Show. Russia has commenced the creation of a 6-generation jet fighter. Russia’s Sukhoi aicraft manufacturer has begun the development of a sixth-generation jet fighter, Russian Deputy Prime Minister Dmitry Rogozin said Wednesday. “Of course, there were talks today about planned work, ideas for the creation of a sixth-generation fighter. Of course, we are still working on the fifth generation, but the developers are looking forward and that is the right thing to do,” Rogozin said following a meeting on the development of Russia’s military aviation. Meanwhile, Aerospace Forces Commander Col.Gen. Viktor Bondarev said Wednesday that Russia was also working on a seventh-generation jet fighter. Currently Russia is testing its fifth-generation aircraft, PAK FA. The jets will enter service in 2017. Russia’s deployment of four state-of-the-art Su-35S fighter jets to Syria swiftly hit international headlines, with Western media describing the Su-35 as one of the most dangerous fighters in the world,” according to the Russian newspaper Rossiyskaya Gazeta.The newspaper mentioned the German magazine Stern, which stated that the Su-35S can be considered the world’s deadliest fighter jet other than the fifth-generation US F-22. As far as flight characteristics are concerned, the Su-35 is significantly superior to its competitors, combining the best features of the fourth generation fighter and the basic features and properties of a fifth generation warplane, according to Stern. The magazine was echoed by the US newspaper Washington Times, which said that the Su-35S will add significantly to Russia’s ability to protect its aircraft in any area of the Middle East, in light of Turkey’s downing of a Russian bomber in Syria in November 2015. “The deployment also sends a message to Turkey that, in combination with the S-400 anti-aircraft missile system, Russia can defend its aircraft anywhere in theater with weapon systems equal to or even more capable than NATO can field,” the newspaper said. The US international affairs magazine The National Interest in turn quoted a high-ranking US military official as saying he was quite impressed with the Su-35S. “It’s a great airplane and very dangerous, especially if they make a lot of them. I think even an AESA [active electronically scanned array-radar equipped F-15C] Eagle and [the Boeing F/A-18E/F] Super Hornet would both have their hands full,” he said. The Su-35S’s super-maneuverability is provided by a new engine with thrust vector control, which allows the aircraft to reach supersonic speeds without using afterburners. Defined as a Generation 4++ fighter, the Su-35S is capable of flying at a speed of up to 2,400 kilometers per hour and ascending to a height of 20,000 meters. The plane’s maximum range stands at 3,600 kilometers, and with an additional fuel tank the figure can be increased by 900 kilometers. Notably, the Su-35S was developed with the help of high technology used in the creation of Russia’s fifth generation aircraft, the T-50 PAK FA. For example, the Su-35S’s crew consists of one pilot, and the plane is controlled without using analog devices, which were replaced with just two screens on which all the information is displayed.Western military experts were especially impressed with the Su-35S’s sophisticated phased-array radar control system Irbis, which allows the plane to detect targets at distances of up to 400 kilometers, as well as track aerial targets and engage up to eight of these targets simultaneously. On February 1, Russian Defense Ministry spokesman Igor Konashenkov said that the four Su-35S fighters have been deployed to Hmeymim Airbase in Syria. The warplanes are expected to provide coverage for SU-24 bombers, which launch airstrikes on Daesh and Al-Nusra Front militants in Syria.